The global sun care market is moderately consolidated among players such as Unilever, Johnson and Johnson, L’Oreal, Coty Inc., Estee Lauder, Beiersdorf AG, Shiseido Company Ltd., Groupe Clarins, Burt’s Bees, and Bioderma Laboratories. While these players are likely to remain the key stakeholders in the sun care market in the coming years, leading companies such as Johnson and Johnson are expected to expand through acquisitions, as several small players have innovated promising advances in sun care in recent years and are likely to remain a key component of the sun care market in the coming years. The need for product diversification is the key driver for the expected consolidation in the sun care market in the coming years. Due to the relative ease of developing sun care products, specialization has failed to become a profitable strategy in the sun care market. This has led to an increase in R&D investment as well as acquisition efforts. 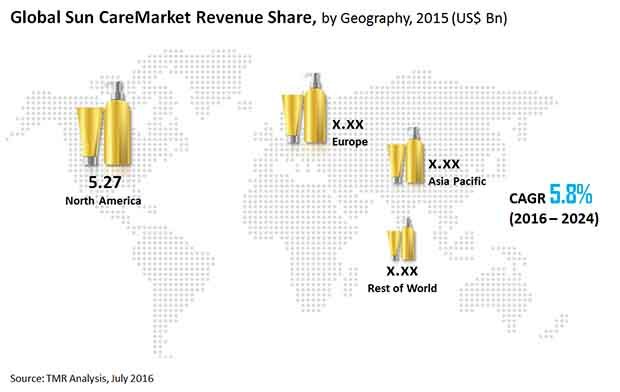 According to Transparency Market Research (TMR), the total annual revenue of the global sun care market was US$15.8 bn in 2015 and is expected to rise to US$24.9 bn by the end of 2024. This represents a sturdy 5.8% CAGR between 2016 and 2024. By product type, the global sun care market is segmented into sun protection products, after-sun products, and self-tanning products. Of these, sun protection products accounted for a majority share in 2015 and are likely to remain similarly dominant through the 2016-2024 forecast period. The segment’s total annual revenue in 2024 is expected to be US$15.8 bn. The sun protection products segment is further segmented by sun protection factor into SPF 6-14, SPF 15-30, SPF 30-50, and SPF 50+. Of these, the SPF 30-50 segment dominated the global sun care market in 2015, as these products usually offer the perfect compromise between the high prices of premium products and the relatively lower efficacy of cheaper ones. SPF 30-50 products are expected to account for around 40% of the global sun protection products market by 2024. Regionally, North America is the leading contributor to the global sun care market. The regional market is expected to generate total annual revenue of close to US$8.7 bn by 2024, accounting for around a third of the global sun care market. However, the Asia Pacific market is expected to undergo rapid growth by 2024, exhibiting a solid 6.9% CAGR between 2016 and 2024. The prime driver for the sun care market in developed regions is the rising concern regarding the threat of skin cancer. “Due to the high prevalence of a fair skin tone in North America and Europe and the rising awareness about the depletion of the ozone layer, sun protection products that offer specialized protection against ionizing solar radiation have become popular,” explained TMR’s lead analyst. The popularity of self-tanning, also due to the widespread prevalence of a fair skin tone, has also been a leading demand driver for sun care products in Northern regions such as North America and Europe. The diversity of function of modern sun care products has also become a key driver for the global sun care market. In addition to protection against solar radiation, modern skin care products also target acne, signs of aging, dark spots, etc. This has removed the need for multiple skin care products, which has been a key factor in driving the demand for modern sun care products in the last few years. On the other hand, the ease of entering the sun care market has resulted in a proliferation of cheap substitutes, which have not only corroded the profit margin of the sun care industry but have also hurt the consumer perception of sun care products due to their low product quality. This is likely to remain a key restraint on the global sun care market in the coming years, as many sun care product manufacturers are looking to enter the market in developing regions, where counterfeit products are popular.